Someone who shall remain nameless forgot to take the memory card out of the computer and put it back in the camera. Which is a shame, because the progress of the outside was definitely worth a picture. I’ll snap one right away in the morning so you can see what a hero Mark is. The shop is awesome. Really catches your eye. A red and white checkerboard will do that. Especially when the squares of the checkerboard are….more than 12 inches square. Hmmm. I wonder how big those are? I’ll have to measure. Mark thought that if we don’t make it with the yarn and the fabric, we could always try selling ice cream. It does rather look like an ice cream shop. Paint is funny. You start with the door, because the paint is wearing off where people have been pushing on it for the last 5 or so years. Then you have to move on to the trim, because that looks pretty dingy next to the freshly painted door. Pretty soon your husband is up on a ladder painting the entire front of the store. And you start looking at the poles inside your windows thinking those look kinda dingy now, since everything else is white or red and the poles are still the old beige. Except, you can’t figure out how you are going to get your brush in between the window and the pole and actually paint the side of the pole that’s is inches from the window. An attempt was made at wrapping the pole with fabric. I say attempt, because I’m not sure it was successful. I think it’s a good idea, but the execution left something to be desired. With the amount of work I put into it and the swearing and sweating involved, it may have been faster to paint the darned thing. Although, tha twould have been significantly messier. Shoot. This post would be much more interesting with visuals, wouldn’t it? 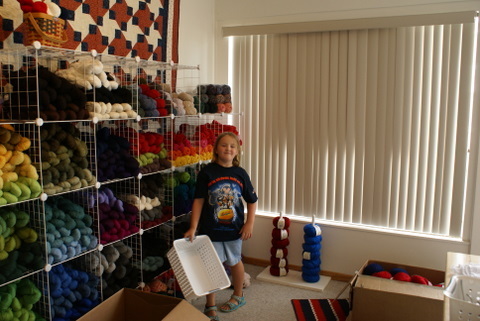 On Thursday, my niece Lucy got to move a bunch of yarn around and put some price stickers on. Her Mom spent the afternoon helping me price knitting needles and crochet hooks. They were a HUGE help. HUGE! But somehow I missed getting a picture of Diane. Have to remedy that the next time I coerce her ask nicely and get more help. Speaking up help: getting some sleep was a good idea. I probably shouldn’t post when I’m awake at 1 AM. It’s nearly 1 AM and I haven’t been able to convince the brain to turn off yet. I received an interesting mix of answers to my previous survey question. To follow up, I can track inventory in the shopping cart I’m using, which means that if I tell it I only have 2 — it won’t let you buy more than that. If it isn’t available, you can’t buy it, but I can decide whether it disappears when it is sold out, or if it still shows up as a product, with OUT OF STOCK displayed instead of the add to cart button. I could be convinced to go either way, and many of you have given me compelling reasons (that I had already been considering) on both sides. Just one of a zillion details to take care of. It’s always darkest before the dawn, right? Cause right now, it’s pretty dark and murky. Overwhelmingly so. Today was one of those mixed-bag kind of days. We had to do some shopping this evening which wore us all out. Earlier in the day, I got a surprise visit from Miki and Diane who were bringing me patterns (and samples!) and t-shirts to have on hand for the shop opening. (If you visit their site…I have the 3 pieced patterns and the Life is Simple t-shirts…). I tried to do something brilliant about getting images of the notions and…it turned out to be brilliant only in my head. So that was a waste. I don’t even remember what I did this morning. It was too long ago. And now, I’ve got these brand-new ideas that I would love to make happen, but I think I’m running out of time….one is t-shirts! Don’t you think the STAFF of Knots & Bolts need t-shirts? Yeah, right. I’ll get right on that. Oh! and I need to find someone to digitize my logo for embroidery! Plus, I had a brainstorm about something to use as an in-store shopping basket of sorts (those skeins and balls of yarn are hard to hold on to!) and the couple of stores we visited after my brainstorm didn’t have what I was looking for. 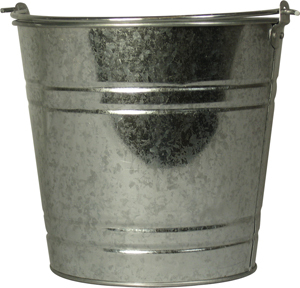 A 5 quart galvanized pail! Isn’t it adorable? I think it fits the look/feel of the shop. So have you noticed how this post has veered from overwhelmed and whining to excited and happy?? That pretty much sums it up. I suspect there will be more of that to come. I think I’m finally sleepy enough to hit the hay. Morning will be here awfully soon.